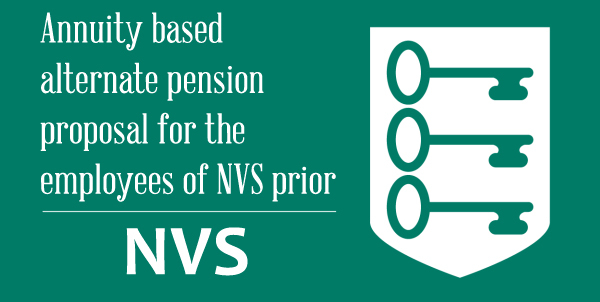 Sub: Annuity based alternate pension proposal for the employees of NVS prior to 1.1.2004 – reg. 1. Own share of employee in the existing CPF scheme shall remain intact. It will not be utilized for creating the corpus fund of the alternate pension plan. 2. However, the management share of the existing CPF scheme will be utilized to form the corpus fund for the proposed annuity based pension scheme. 3. Proposed basic pension is 50% of the basic pay at the time of retirement and there is no provision for DA thereon. 4. Provision for commutation of pension upto 1/3rd of the basic pension exists..Employee at the time of retirement can get the commutation value. It would be more or less equal to the management share. Besides 213rd of basic pension per month fixed at the time of retirement is payable. 5. The pension is payable till the pensioner is alive. There is no provision for family pension after death of the employee. 6. However, proposal for provisioning of DA and family pension is also being sent to the Ministry for consideration. 7. In case of death of the eligible employees during service, Provision for a lump sum insured amount payable to their dependents is proposed to be covered under group term Insurance Scheme.